The wait is finally over! Canada’s highest ranked urban axe throwing club is now in Edmonton. Bad Axe Throwing has been dominating the special events scene in Ontario since day 1. It’s time Alberta has a chance to celebrate birthday parties, bachelor parties, bachelorette parties, and corporate events with Bad Axe Throwing Edmonton. As a Canadian, there’s no better way to celebrate your occasion than booking a party where everyone learns how to throw an axe and compete in a tournament lumberjack style. Axe Throwing in Edmonton hits the Edmonton running on January 9th, 2016 for an open-house. This is a two-day event that gives everyone an opportunity to throw axes for FREE! Learn about the parties we can offer in Edmonton, meet the coaches and get involved in the Bad Axe Throwing Edmonton League. Anyone interested is encouraged to RSVP here. This is going to be a huge event – the perfect way to kick of 2016! Our Edmonton location can be found at 5466 – 136th Ave NW, Edmonton. Hours of operation run from 8am to 11pm every day. We can accommodate nearly any schedule with sufficient notice. Booking a party a month in advance is advisable and bookings must have a minimum of 6 people. We’ve recently decided to implement a HEROES RATE! We offer 25% off for Ambulance, Firefighters, Nurses, Military & Police. Just show your ID and get the low rate of $30/person. We also have lanes available for walk-ins. The schedule is posted on a weekly basis, so it’s important to check the website the day of for the most up to date information. The rate for walk-ins is only $20/hour per person. 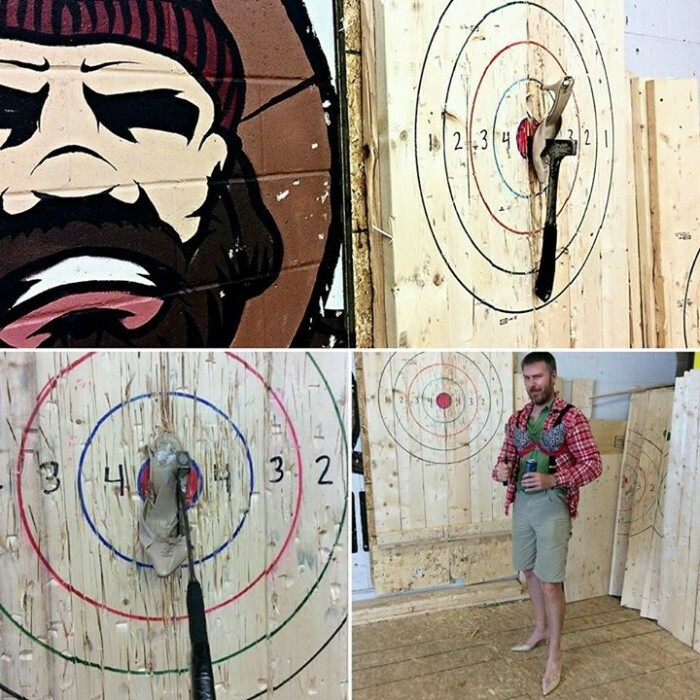 Bad Axe Throwing Edmonton also offers a novel way to celebrate corporate events. Bad Axe Throwing has hosted some of the world’s largest companies (and smallest) to have team building activities or simply a great time out with co-workers. We can cater to all styles of corporate events. Custom grand prizes for tournament winners, hands on tournament customization for the type of company and occasion, and a high priority on team building strategies are among the many unique approaches to corporate events that we offer. Contact us to discuss your ideal corporate event and the team at Axe Throwing Edmonton will make it happen. Bad Axe Throwing gets tons of birthday parties every week. The birthday party has to supply the cake but we will keep it cold next to your beverages of choice for the right birthday wish moment. Common birthday wishes include wishing the axe throwing party will never end. Play Unpin the Tail on The Donkey among other classic birthday party games. The only difference this time is the birthday party wields axes instead of streamers. Pop balloons the adult way and celebrate a new year with a new skill. Axe throwing events are for everyone with the basic ability to throw. We will start every event with the basics. Safety comes first and then a warm up session where everyone gets a chance to throw an axe until they have a feel for it.